The two ultimate powerhouses of European men's beach handball clash in the final of the EHF Beach Handball Champions Cup 2018 in Catania on Sunday: Defending champions “Ekaterinodar” Krasnodar and multiple ebt Finals winners Detono Zagreb. The Russian side from Krasnodar is still to lose a set at the 2018 Champions Cup and reached the final following 2:0 wins against HEI Skaering (19:14, 26:16) in the quarter-final and BC Sand Devils Minden (24:13, 25:7) in the semi-final on Saturday. Detono Zagreb got rid of Göteborg Beach Handball Club and OFKSE-LINMAR from Hungary in equally confident fashion to set up the final that everyone had been waiting for in Catania. The match throws off at 15:30 hrs and is streamed live – like all other matches on Sunday – on ehfTV. In the women's event, Spanish side and 2017 winners C. BM Playa Algeciras had to bury their dreams of a successful title defence, following a 2:0 loss (24:28, 16:17) in the semi-final against Multichem-Szentendrei N.K.E.. The Hungarian's opponents in the final will be GRD LECA – apostaganha.com from Portugal who beat Aker Topphandball from Norway 2:0 in the semi-final. The women's final starts at 14:30 hrs on Sunday. The matches for third place between C. BM Playa Algeciras in the women's event and BC Sand Devils Minden and OFKSE-LINMAR in the men's competition take place at 12:30 and 13:30 hrs respectively. Over the four days of the tournament, the EHF offers beach handball fans plenty of opportunities to follow the event. All matches of Court 1 and Court 2 will be streamed live on ehfTV. There will be TV coverage in Denmark and Norway on Viaplay, Germany on Sportdeutschland.de and Hungary, Czech Republic and Slovakia on Sport1. This coverage will be supplemented by a number of highlight and best of-clips from the event which will also be available on YouTube as well as on the EHF Beach Handball Facebook page. 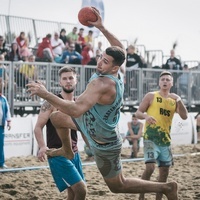 All matches can be followed with the dedicated beach handball ticker and the respective statistics are available for all men's and women's teams on the respective event pages. Furthermore there will be continuous updates via Instagram stories on the EHF Beach Handball account.